Today the Streetsblog Network is mourning Deb Hubsmith, who died this week at age 45. Deb founded the Safe Routes to School National Partnership, a nationwide program that is saving the lives of children endangered by reckless drivers. If you’ve advocated for or cared about safer streets in the last 10 to 15 years, chances are you’re aware of or have been influenced by Deb’s work, even if you don’t know it. She dedicated her career to bicycling and walking advocacy at the local, state and national levels. 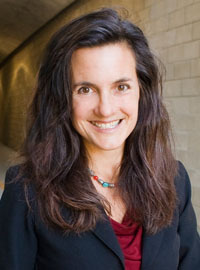 She began her advocacy as the founding executive director of the Marin County Bicycle Coalition, where she helped develop the county’s Safe Routes to School pilot program. She championed the nation’s first statewide Safe Routes to School program in California and also a nationwide program, which passed the U.S. Congress and resulted in more than $1 billion for Safe Routes to School programs across the country. She also brought the Safe Routes to School National Partnership from an all-volunteer organization to a coalition with 750 partners, 30 staff and a $3 million budget. Deb was director of the partnership for nine years. You can read the partnership’s tribute here.